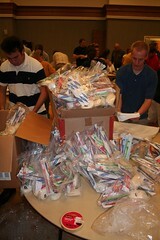 Last month I posted about a service project our ward was doing to assemble hygiene kits to be sent to Zambia, Africa. We raised almost $3,000 and purchased the supplies for the kits from Mandalay International. The kits ended up costing about $3 a pop. Tonight during Family Home Evening we assembled all of the kits and in a month or two they will be shipped off to Zambia with the help of Mothers Without Borders. The pictures from tonight can be viewed on my Flickr page here. This is a very nice project Connor. You guys and gals have done a nice deed. Job well done Connor.